Trick or treat! 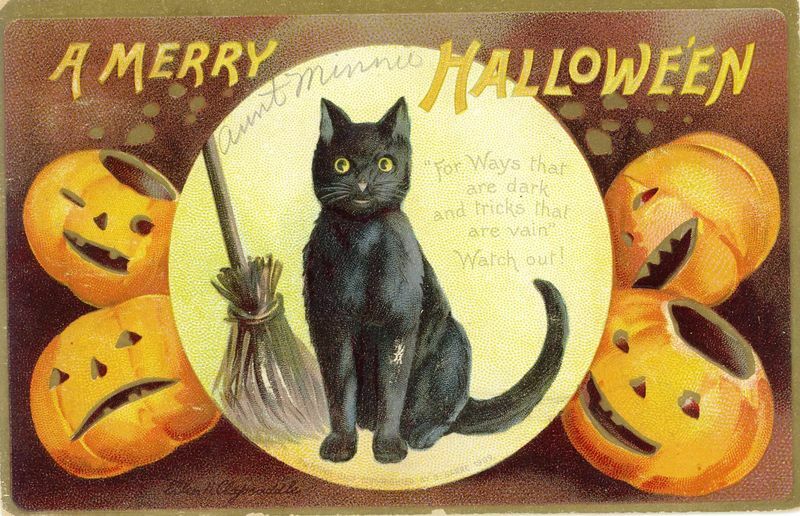 Since today is a travel-day for me, I've pulled this Halloween-themed post from the archives. While modern candy-makers offer scores of new treats every year, there's one that's stood the test of time: candy corn. 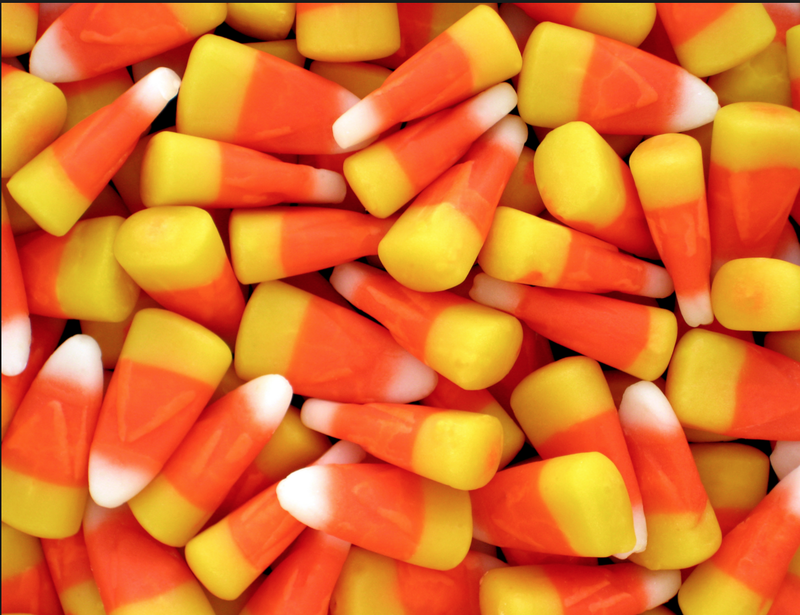 According to the food experts at Gourmet magazine, candy corn was first created in the 1880s as the culinary brain-child of Philadelphia's Wunderle Candy Company. Nineteenth century candy-lovers were already gobbling sugary treats in the shapes of vegetables, fruit, and other plants, and Wunderle owner George Renninger suggested the company try kernels of corn next. This was more a marketing challenge than a candy-making one, for Americans at the time regarded corn as feed for livestock, not people, and very little was consumed on polite dining tables. But Wunderle's tri-color layering captivated buyers, and the new little candies were an immediate hit. Originally linked to harvest and available only in the fall months, candy corn soon became connected with Halloween as well, and as Halloween as a holiday grew in popularity in the 20th c., so did candy corn: today the industry sells more than 35 million pounds of candy corn each year. That's one sweet treat. 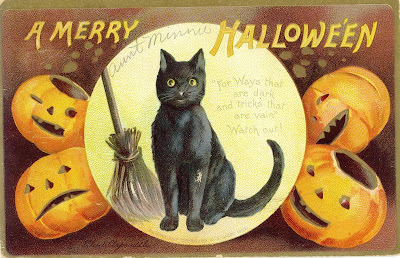 The delightful Halloween postcard, below, comes from the collection of the Toronto Public Library. Printed in 1909 in Germany for the American market, this postcard is only one that the library shared on its blog here - definitely worth a look! As a Canadian, I first encountered candy corn when I was a grad student in the States back in the late '70s. 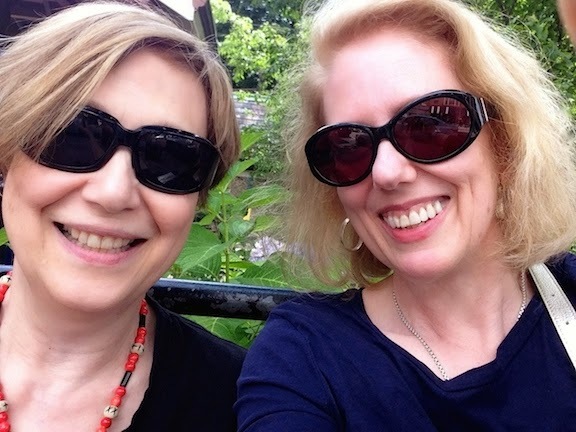 It didn't hold any attraction to me then, nor later when my family spent 16 years living in Washington, DC. Too sweet (although how can that be, in a candy?) and not much detectable taste. I don't think it's ever caught on here north of the border. Friday Video: What Is The City of London?